The player chooses between two teenage characters, Zeke and Julie, or both in two-player mode. They navigate suburban neighborhoods, shopping malls, pyramids, and other areas, destroying a variety of horror-movie monsters, including vampires, werewolves, huge demonic babies, and the game's flagship, zombies. In each of the 48 stages (excluding the bonus levels) the goal is to rescue the surviving neighbors, at which point a magical door opens that will take the player to the next stage. 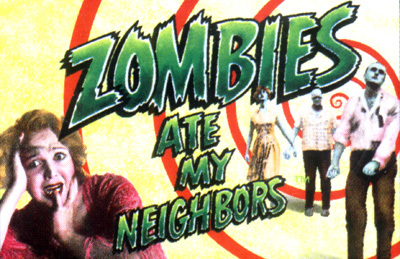 However, if the player is not careful, any enemy in the game will kill the neighbors, preventing them from being saved. At least one neighbor must be saved from each level to progress to the next.